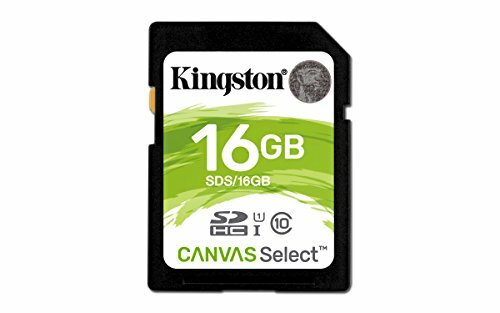 Kingston’s Canvas Select SD card is designed to be reliable, making it ideal for filming in HD and shooting hi-resolution photos on your point and shoot camera. This card is tested to be durable*, so you can take it anywhere with confidence that your photos, videos and other data will be protected. It’s available in multiple capacities up to 128GB**, to provide plenty of space to capture life’s adventures. * IEC/EN 60529 IPX7 certified for protection against continual water submersion up to 30 minutes and depth up to 1m. Withstands temperature range from -25 °C to 85 °C. Based on MIL-STD-883H, METHOD 2002.5 military standard test method. Protected against X-ray exposure based on ISO7816-1 guidelines. ** Some of the listed capacity on a Flash storage device is used for formatting and other functions and thus is not available for data storage. As such, the actual available capacity for data storage is less than what is listed on the products. For more information, go to Kingston’s Flash Guide at kingston.com/flash guide.